I hope everyone else has been having as much fun this summer as I have! Of course my garden looks like crap but I have to admit the weeds have had a spectacular year. It was soooo cold for soooo long this spring that the veggies that actually sprouted are way behind. I’m not sure if there will be anything at all except some herbs and a few green beans to harvest. There are a few tomatoes on the vines but they are very green and with the cold nights I’m betting we will have a house full of green tomatoes this fall. Since it is just plain depressing to go out into the garden I have been keeping busy with other stuff… Some really fun stuff. I have been working on my little camper – Rattlin’ Ruby and she is starting to look pretty darn spiffy. We have the Custer County Fair this weekend, a Sisters on the Fly event in Buffalo WY next weekend and finally a car show to enter her in next month. In a moment of total and complete insanity I started polishing her silver aluminum hide. Of course when I started this little project it was hot and dry but since then the skies have opened up and it rains just about every evening so my polishing has come to a screeching halt. Only about a third of Ruby’s back-end is polished and about half of one side. She looks a little goofy right now but that will not stop us from going to the fair. We leave today and will carefully weave our way through the masses of motorcycles that are on the road this week for the Sturgis Motorcycle Rally. It should be fun! This last few weeks have been filled with even more fun. I know – it’s hard to believe it can get any better than polishing an old camper, right? Ha! The first thing we did was the Days of ’76 in Deadwood. I have never been to the ‘Days’ and I have lived here a really, really long time. I didn’t get very good photos but we had a blast! Dalton and Dani were the ones who came up with this wonderful idea and so we jumped in the pickup and drove to Deadwood where we had a fantastic meal at the 4 Aces Casino – prime rib and crab legs. My advice – forget the salad bar and head straight to the good stuff. 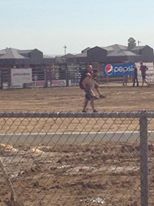 From there we walked (actually we waddled) down to the Rodeo grounds to the vendors who ended up with some of my hard-earned cash and the grandstands which are amazing on their own. Built from huge logs it’s like a work of art you can sit in. I’ll try to post some photos when I get back from the fair. 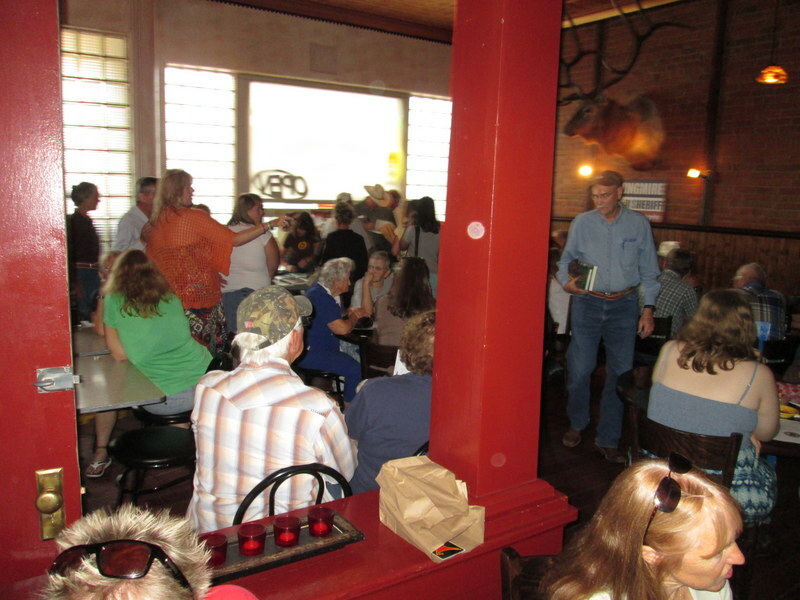 The 2nd fun thing I did was to go to a party at the Antler’s Bar & Grill which was hosted by the Newcastle Library. You got to love a library which holds a get together at a bar! 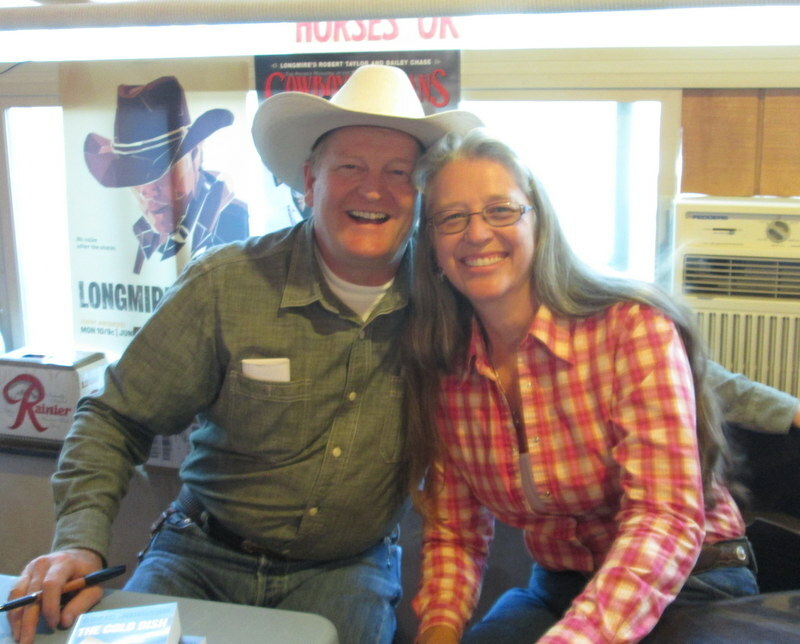 This one was for Craig Johnson – the wonderfully talented author of the Longmire series of books which inspired the TV show – Longmire. If you haven’t been watching Longmire on Monday nights you have been missing out! The story is based on the sheriff – Walt Longmire who lives in the make-believe town of Durant, WY (which is patterned after Buffalo, WY). Craig lives in Ucross which is a small town close to Buffalo. 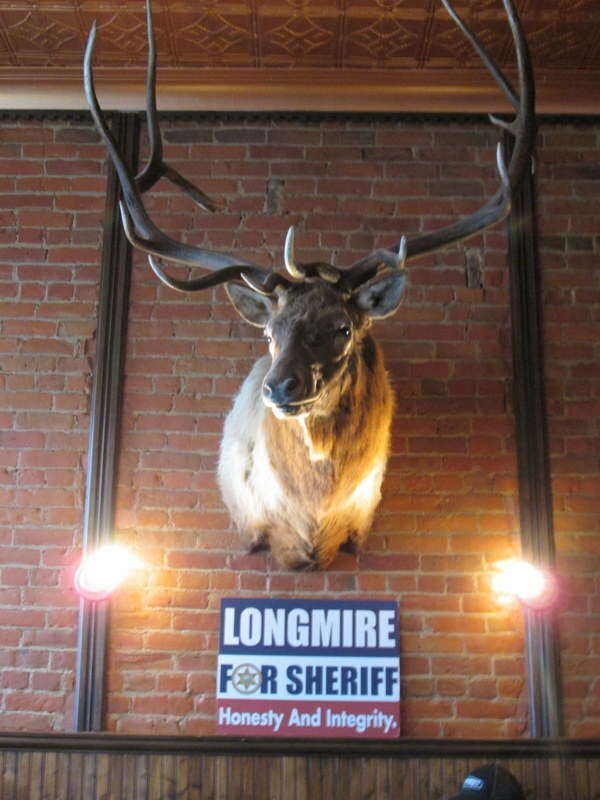 The Buffalo Chamber of Commerce have celebrated Longmire Days for the past 3 years and I have wanted to go every single year. I haven’t made it yet but I am definitely going next year. Craig is traveling around the state of Wyoming and visiting all 73 Wyoming libraries to talk about his book The Spirit of Steamboat. What a nice guy! He is a wonderfully funny speaker and is so humbled by the amazing success of his books and the show. Its obvious he loves Wyoming and the people who live there and has become something of a local hero although you would never know it to speak to him. In fact the Libraries ‘pay’ him to come speak with a 6 or 12 pack of Rainer Beer – which is Sherriff Longmie’s favorite drink. He says he hasn’t bought beer in 7 years!. What a great sense of humor. As you can tell I was very impressed and inspired by his talk. I may just have to start writing murder mysteries too! In my free time of course… Dang, I’m funny! I suggest you read his books (and the entire Britannica encyclopedia set) while you wait for my book to come out. I believe the library also has Seasons 1 & 2 on DVD of the TV series. 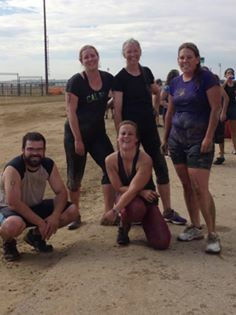 The 3rd really fun thing I did last week was to join a few people from work who wanted to do a Mud Run. This event was hosted by the Campbell County Mudders to raise money for the families of the 3 miners who were killed in a bus/car accident a couple of months ago. It was for a good cause so I figured why not? How bad could it be? There were 5 members of our team – some of which actually like to run (go figure) and some of us who were built more for comfort than speed (myself included). OK – I must admit most people who do these runs actually spend time training for them but since it was kind of a last-minute thing we had less than a week to prepare. I trained by eating as much chocolate as possible and by running 2 laps around the house one evening. It took me 2 days to recover from that. Even with that extensive training, I was not prepared for what we ended up doing. Silly me. I imagined we would be jogging around the horse track at Camplex with a few mud puddles to run through. 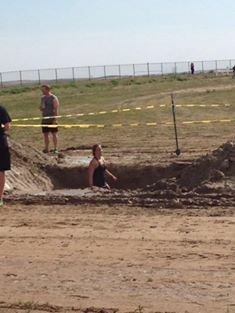 Turns out that this event was one that would be classified as an Extreme Mudder Run. As I always say “Go Big or Go Home”. That’s Beth, one of my team mates in the picture above. She was in the first obstacle. Who knew they would build obstacles in a race? They had dug 2 holes in the track, piled the dirt up on each end of the holes and filled both holes with water. And that was just the first of many ‘fun’ things to come. The course was 5K (or 3.1 miles) and was run in 2 laps with 16 obstacles in each lap. 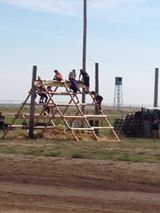 The 1st obstacle – pictured above – we had to do 3 times. Can I just say one word? If you’ve never had any experience with this powdery grey mineral you might not realize what water does to it. I on the other hand I have helped seal off stock tank leaks with the stuff and have learned all the fascinating properties of the stuff. I have found that combining water and BENTONITE creates one of the slickest, gooiest, stick-to-your-body gunk you will ever run into. And ‘run into it’ we did. We ran through it, slid down it, swam through it, climbed up it and slithered on our bellies like a reptile in it. As if the challenge of wet BENTONITE wasn’t enough there were also huge tires from large mine vehicles to climb over, a cable bridge stretched between two tow trucks to fall off of, barbed wire (one with electricity to zap you) to crawl under, culverts to crawl through, structures to climb over, large round hay bales to climb up and over, a large roll-off dumpster lined with plastic and filled with water you had to wade through and duck under wooden walls and a vast plethora of chances to break a hip on. As I get older I find myself thinking about that stuff more often. Thankfully, Beth’s daughter was there to take pictures of us as we worked our way through the course. I figured I might need them for insurance purposes too. Thank goodness for my fantastic team mates. That’s Jonathan hauling my lazy *%$ through part of the course. Actually that was one of the obstacles – to carry a team-mate for a distance. We had to stay together as a team and surprisingly we did pretty good – less than 90 minutes to get through it all. We even beat out a team of 21-year-old gals who had to ask another team of guys to help them along the way. Of course that could have been their plan all along – if you get my drift. You can’t really see what a mess we were. But they did direct us to the livestock wash racks before allowing us into the bathrooms if that gives you any indication of how we looked. I’m still picking BENTONITE out of my belly button. I have to admit I am rather proud of our team and even myself. With a little help from my friends I was able to do every obstacle except one – climbing over a 15 foot wall with a knotted rope to pull yourself up with. I’m going to have to work my way up to that one. But all in all I didn’t do too bad for a 52-year-old woman who sits at a desk all day and eats massive amounts of chocolate. Will I do it again? I just might. I must admit that when I hit that first obstacle my first thought was “What the hell did I get myself into?” But completing each obstacle and crossing that finish line was a rush I haven’t felt for a long time. Yep, I’ll do it again but next time I’ll train a little better – more chocolate and maybe 2 more laps around the house!!! Now I’m off to have more fun! I bet you thought I had fallen off the face of the planet – didn’t you? Well, I didn’t – but my computer nearly did. After a long time and a small pile of cash things are finally getting back to normal. It has been a cold, dark and dreary winter and we are all ready for spring to roll in like a run-away Mac truck without brakes but winter has been pretty stubborn around here. Even so, I have been watching for any sign of spring and am happy to announce that even though it is only March the first spring flowers are blooming here at the ranch! Of course they are dandelions and they are growing inside the greenhouse. I really should take the hoe to them but after last winter I am content to watch them bloom – for now. 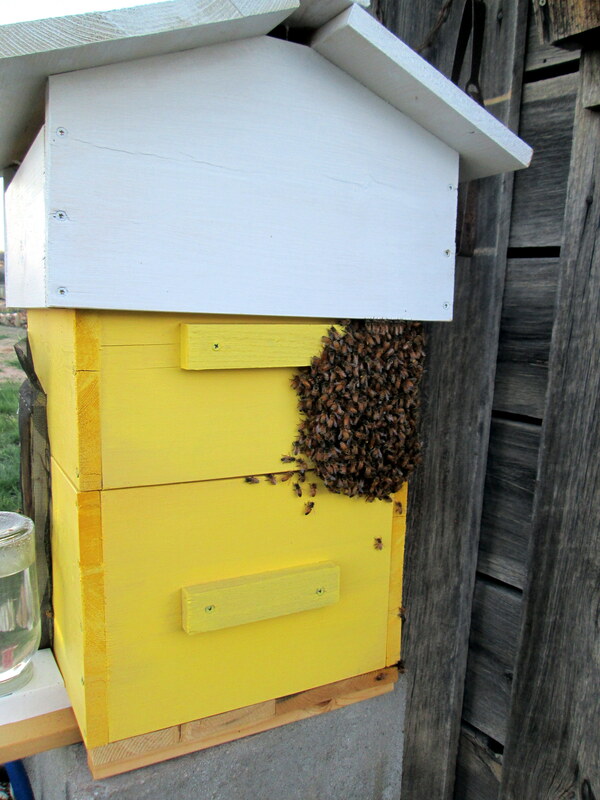 The best news though is that it appears both of the beehives have survived the winter. As cold as it was I was getting a little worried about them and had even sent off an order for 2 more packages of bees to arrive the end of April. But then it happened – we had a few nice days above 50 degrees and we saw the first activity at the entrances. They’re moving slow and they don’t get very far from home but they are moving. I was sad when I realized they were moving dead bees out of the hive and piling up the little carcasses on the ground out front. It was a really tough winter. I am amazed that they can survive temperatures of -30 (or colder) with just a loose wrapping of tar paper to help block the wind. We did leave them with plenty of honey – 4 boxes instead of the 2 that all the books suggest so I didn’t really worry about them starving to death but I did worry about the wind. With those extra boxes the hives were a little bit top-heavy but the straps and cement blocks held them steady enough – at least until last Tuesday morning. I heard the wind before I even climbed out of bed. It was howling pretty steady then around 6:00 am the house was hit with a gust that sounded like it was trying to tear the roof off. One huge blast then 15 minutes later the wind died down and had nearly quit. It was a bit eerie, but we still had a roof so I figured everything was OK until I stepped out to feed the chickens and found Beatrix’s hive tilted to the side at about a 45 degree angle! 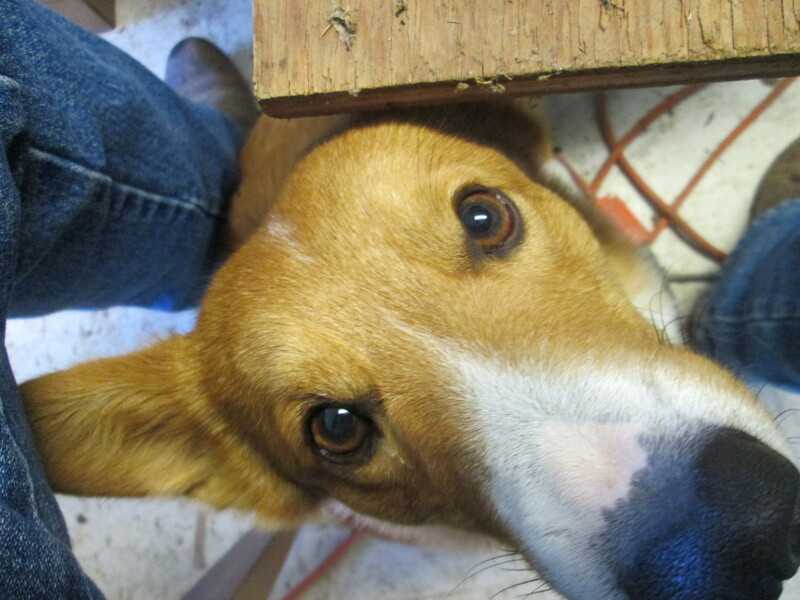 Steve (our Corgi) nearly jumped out of his skin when I screamed and ran across the yard. He hasn’t seen me run very often and frankly – he doesn’t like it. He believes I was built for comfort not speed and I tend to agree. It didn’t take long to realized it wasn’t as bad as it looked. Thankfully, the blue strap, with the snazzy chain adapter, was cinched down tight enough that the hive had tilted as one solid piece and didn’t break apart in the middle. 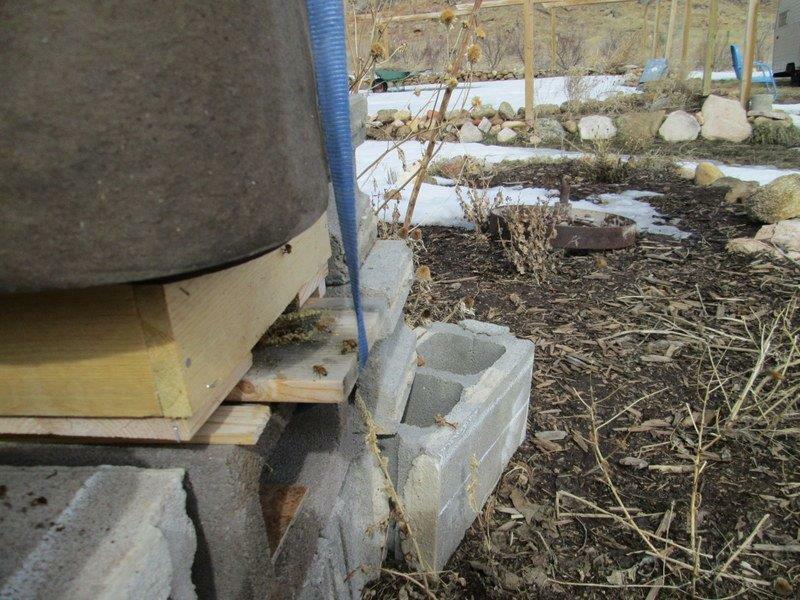 The green strap had also caught the top and kept the whole hive from tumbling off of the cement blocks too so it was just hanging there like the leaning tower of Pisa. It didn’t take much to stand it back up, re-adjust the straps and move a few more cement blocks in beside it. The roof is still a little tilted like it got crammed down really hard but hopefully our girls are OK inside. It was too cold to open the hive right then so I will wait for the next nice day before I check. I have been reading and thinking a lot about bees this winter. There are some great books out there with lots of good information. I have also been building 2 new hives (for the bees that are coming), and there’s also plans for a ‘Honey Hoist’ (so I can lift the hives by myself) and a couple of swarm traps to see if I can catch a wild swarm – free bees is a wonderful thing. From everything I’ve read it’s kind of like fishing. 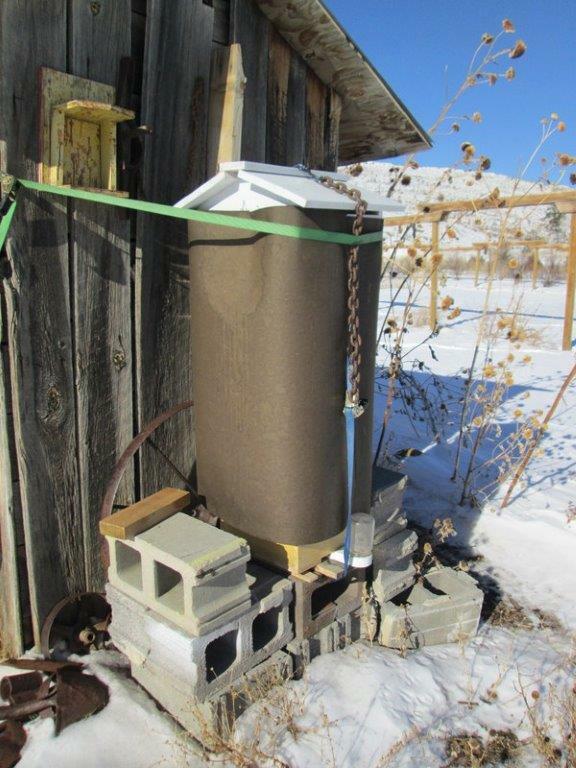 You set out bait – a swarm trap made out of a hive box that has been used and smells like honey and beeswax and then you sit and wait for someone to fly by and take a whiff. Since it’s more of a dumb luck kinda thing I should be really good at this. I have even given a couple of talks to different organizations (and basically anyone who would sit still and listen). Since I am becoming something of a local ‘Honey bee expert’ (that’s code for ‘crazy bee lady’) I have decided to purchase a few props for my next talk which will be for the Custer Mile High Garden Club next Monday night. My lovely assistant Steve has offered to model them for you. Yes, it should be a fun-filled discussion at the old garden club but before I impress the gardeners I will spend this weekend in Cheyenne, WY at the first (but hopefully not last) Wyoming Bee College. 2 days of beekeeping classes, banquets and lots of people who will teach me everything I ever wanted to know about bees but was afraid to ask. The conference is presented by the Laramie County Extension Office and is a really good deal at $50 for both days. It sounds like they have some great speakers lined up and even a few vendors who will sell me wonderful things I simply can’t live without. So I will leave Steve in charge while I am gone. Steve, you crack me up! Winter has started. It’s scary but true. In the first week of October western South Dakota was struck by one of the worst blizzards in history. One to two inches of rain fell before the temperatures dropped and the rain turned to slush then snow. Winds gusted up to 60-70 mph as the snow stacked up. Livestock drifted east – pushed by the wind until they couldn’t go any futher – sometimes piling up in the fence corners where they died. The estimates have been stagering – between 60,000 to 100,000 head of cattle and horses perished and ranchers are still trying to gather what’s left of their herds. We were very lucky. We got the rain and the wind but thankfully only a fraction of the snow others were reporting. We had 2 foot tall drifts but most of the snow blew past us and the cattle at the ranch were still able to graze throughout the storm. We also had the protection of Elk Mountain to help break the wind and our cattle were able to find cover in the draws and gullies. About half of our cow/calf pairs were still on the Forest Service permit where they had some shelter in the trees. Most found their way down the mountain and were standing at the gate wanting in when Hubby went to look. Others, including some of the neighbors cattle jumped fences or tore them down and we spent several days sorting and hauling cattle back to their owners who were glad to have them. We may still be missing a couple of head from the FS permit but we won’t know for sure until we work cattle this Saturday. We will be preg checking the cows this weekend and that will also give us a good idea if we have any other problems because of the storm. Bad weather will sometimes push cows into the trees for shelter but this is not always a good thing. Ingesting pine needles may cause them to abort their calves and this is not a surprise we want next spring. But so far things look good. Our yearlings faired well too. 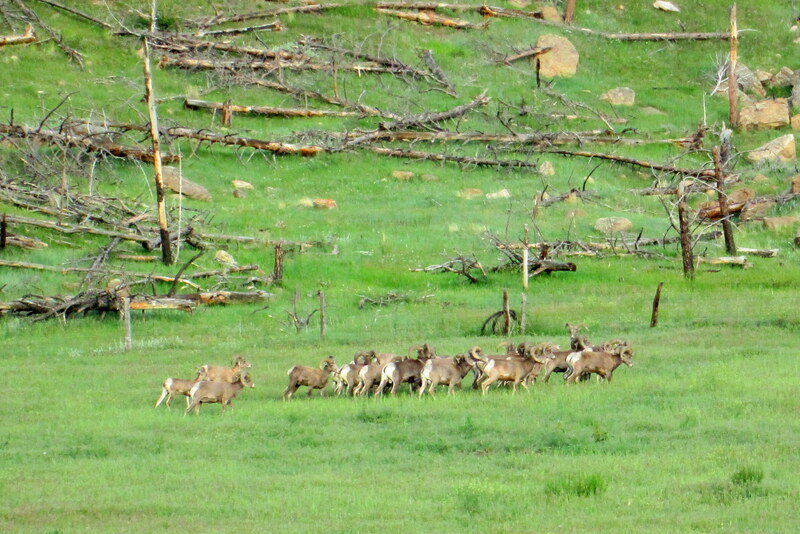 They were in the summer pasture near Custer – where the snow really stacked up. By the time we could make it in to check on them most of them were standing near the corral and Hubby was able to lead them in with a sack of cake and a bale of hay. We were only missing two but we stopped at the neighbors who had already found one of them and was pretty sure the other was in another group of cattle further west. Because of the snow and mud there was no way we could get a trailer up to the next place so we will have to go back once they can get in and make sure he’s actually there. These neighbors had quite a mess at their place. Just west of their ranch is a lot of government land which is grazed all summer by cattle from several ranches. With the wind coming out of the west most of those cattle drifted right down into their place where they spent days feeding and gathering other peoples cattle along with their own. It was several days before the other owners could make it in with loads of hay and it will be longer yet before they can sort and know exactly how many cattle they have left. So many others weren’t so lucky. We’ve got friends who have lost better than half their herd and others who have lost almost all. And that’s just the inital losses. People are still losing cattle daily as the stress takes it’s toll. Some of the stories and information coming out of the worst of it makes no sense at all and makes it even harder to understand. From what I’ve read and heard it appears there were several curcumstances that added up to the horrific losses from this storm. The first being that the blizzard hit so early in the season. Most cattle were still in the summer pastures with little or no cover to block the wind. A lot of these summer pastures are also Forest Service permits or BLM land where cattle from several ranches are run together in huge pastures that cover thousands of acres. Ranchers check on their cattle all summer long but it’s not unusual to go 3 or 4 months without seeing all your cattle. These pastures are nearly impossible to gather quickly from too. 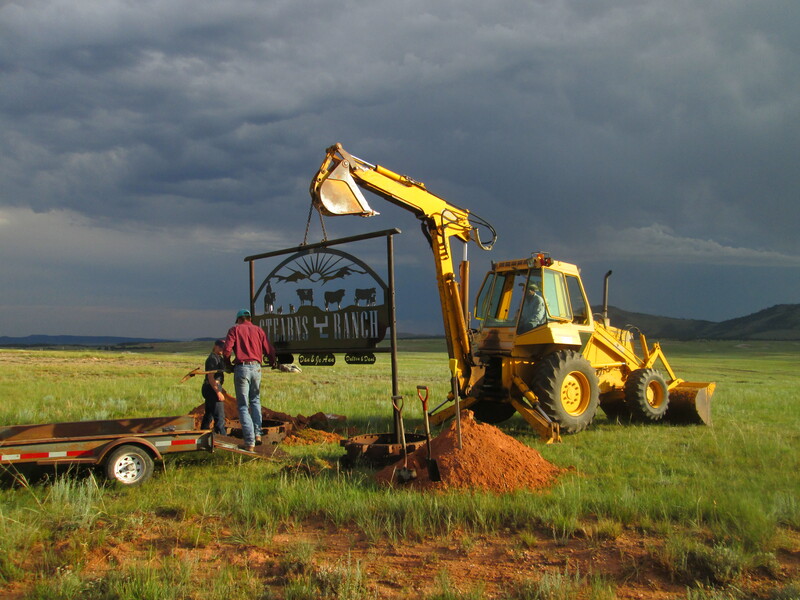 Some ranchers will work for a week or better gathering their cattle in the fall. And if the weather is nice most of the cattle are reluctant to come home until the temperatures cool down and they know winter is coming. Another problem created by the early blizzard is that the cattle and horses hadn’t grown in their winter coats. It has been such beautiful weather that nothing – not even our cats and dog were haired up enough to withstand the temperature drop. Add to that several inches of rain and the wind for a deadly combination. They are even blaming the green grass as a factor. As this was such an unusual summer with lots of rain we still have lush green grass growing which never happens around here. You wouldn’t think it to look at it but fast growing lush grass doesn’t have the nutrients of the dried, cured grasses we bale and feed in the winter. Even if those cattle could have gotten under the snow and grazed non stop they would still not have been able to eat enough to keep themselves warm through the storm. Unbelievable. One of the most incredible facts to me is that they are finding out that all these animals drowned. It doesn’t matter if they were down in a gully or on top of a hill they had breathed in so much moisture that their lungs were full of water. I’m sure the wind added to that as well. They are also finding that most of the losses were cows – not calves. One ranch I heard had lost over 200 head of cows but still had every one of the calves. This is amazing – almost as amazing as the story of one rancher who calves in the fall. He was right in the middle of calving when the storm hit and even without shelter every one of his calves survived it. In a normal storm that would never have happened. There were also lots of horses lost – most in the 2-3 year old range. I know people who have ranched their whole lives and have never lost a horse in a blizzard and yet one Bible camp lost nearly 100 head of horses to this blizzard alone. The government shut down had sent me home from work 2 days before the blizzard hit. Even though I was thankful to be home during the worst of it there was very little we could do but watch as we went from warm sun filled days to rain and snow in a matter of hours. Now that we’re back to work reports have started coming in from local ranchers who have lost a few. Most of the big losses were north, east and south of us. Some of the livestock lost in this blizzard were not insured. Even the ones that were insured were probably not coverd for loss due to blizzards – very few insurance companies cover this. And even though they can prove that these cattle drowned the insurance companies are still denying these claims. And as for any government help… The last Farm Bill expired in 2012 so there are no disaster programs in place that will help these ranchers. Yet there is talk of disaster assistance in the works so we hope and pray that Congress will make this a priority and agree on a way to help. There have been so many heart-wrenching stories in the last few weeks. Stories of cattle that died inside corrals and barns while others on the open prairie survived and newborn calves that survived when adult cows in the prime of their lives perished. At one sale barn alone over 300 head of cattle died in the corrals while one rancher started with over 600 head of cattle and today has 1 left. There are people who have lost everything and will probably not survive the economic losses but more importantly there are those who won’t have the heart to start over after seeing years of careful breeding and hard work wiped away in a couple of days. These are the stories that break my heart. We have had a very busy summer so far. Thankfully, Mother Nature has remembered to turn on the rain this year so we are up to our eyebrows in hay – which is a very good thing. We have also had company for the last couple of weeks – first Dan’s foster-brother, Bill from Boston, then Dalton & Dani and even a bighorn sheep hunter who is gearing up for the beginning of his season which opens September 1st. It has been great! Throw in a ranch full of cattle, a huge garden, a full-time job and 50 new chicks and it’s no wonder I haven’t gotten much done. We had a great time with Bill. He’s really into metal detecting and gold panning so he is always fun to be around. We even took an evening and joined him detecting around the old school house just east of our house. We found some odd items – the metal sides off of old school desks (the wood was rotted away a long time ago), we found some shiny metal disks that had names of different countries so I’m betting they came off of a map of some kind and we found a whole lot of junk. It was great! Dalton and Dani arrived shortly after Bill left. They brought me a horse – Dani wants to try breeding Pistol so she brought me out a beautiful buckskin mare named Becky to swap. Hopefully, Dani will get a couple of nice foals and I will still have a good horse to ride. We got to go riding a couple of the nights they were here and I think we’re both happy with the trade. They stayed for a couple of days then left the horses and their two dogs with us as they headed to the Cheyenne Frontier Days Rodeo (the lucky slobs! LOL). 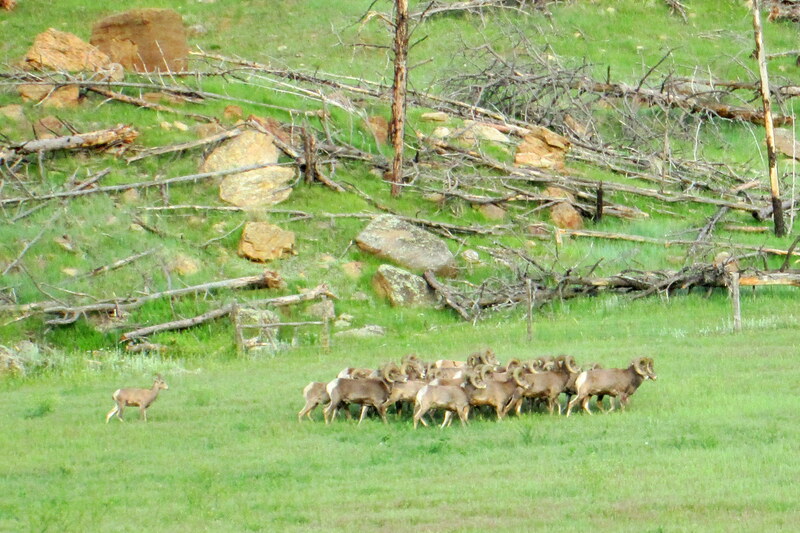 They arrived back at the ranch Sunday and from the sounds of it, they had a great time. They saw a lot of friends. Dalton bought a new hat and Dani got a new yearling filly and a tattoo! Both of them (the horse and tattoo) were SWEET! I want one! The tattoo – I’ve already got a horse. Ha! I love when the kids come to visit – they help us do all the things we keep putting off. This time we put up a sign – and it’s not just any sign. 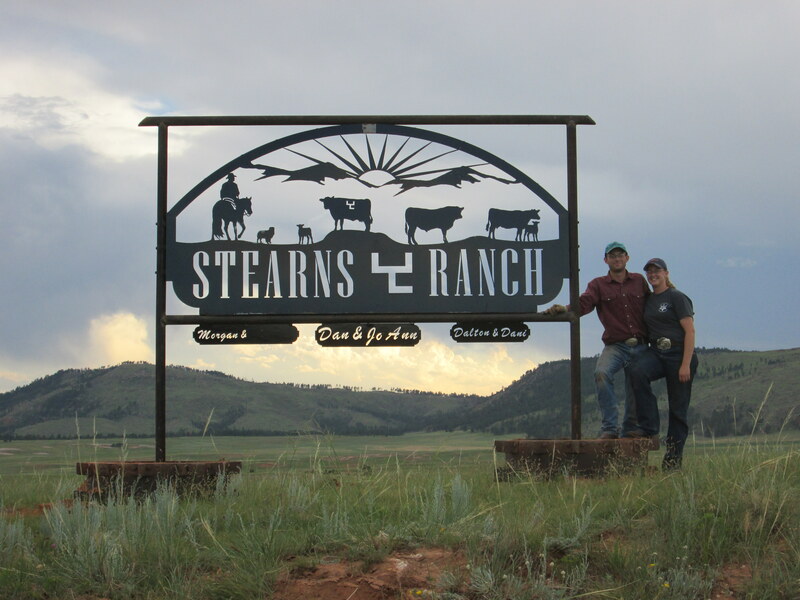 We put up the huge ranch sign that Dalton & Dani gave us for Christmas last year. Dalton designed and cut out this sign for us. He even made the bracket to hold it after they got here. As you can see it took one of my ‘Garden Tractors’ to dig the holes and lift the sign into place. 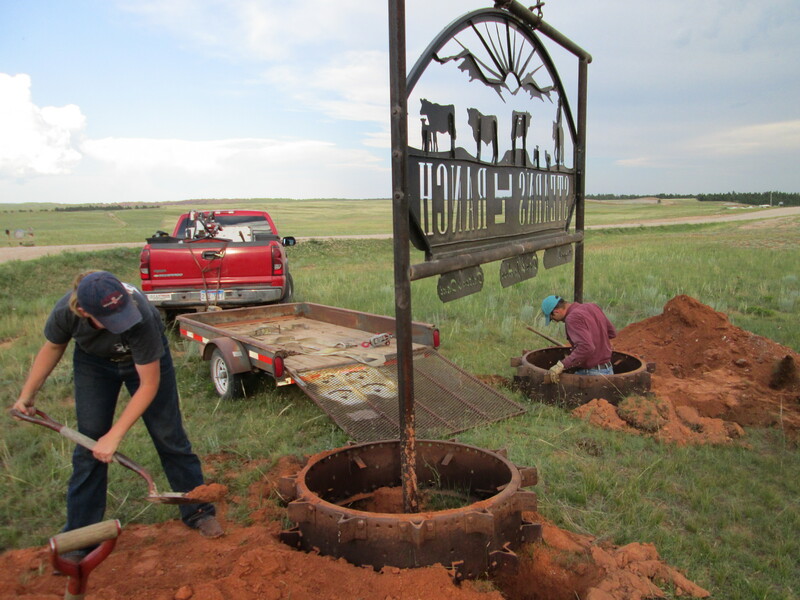 It may appear that Dalton was screwing around while Dani was working hard but actually he was packing the soil into the hole so the sign won’t fall over. I just love the large metal wheels around the base of the posts. They are really old tractor wheels that came off of very old tractor. When rubber tires became available these wheels were swapped out for nice bouncy ones that I’m sure were much easier on your backside. I still have to touch up the paint but I love it. And what a great looking couple! Now I just need to plant some flowers in the wheels – something that the cattle won’t eat like prickly pear cactus and yucca plants. Well. Yah… I mean besides the horses. 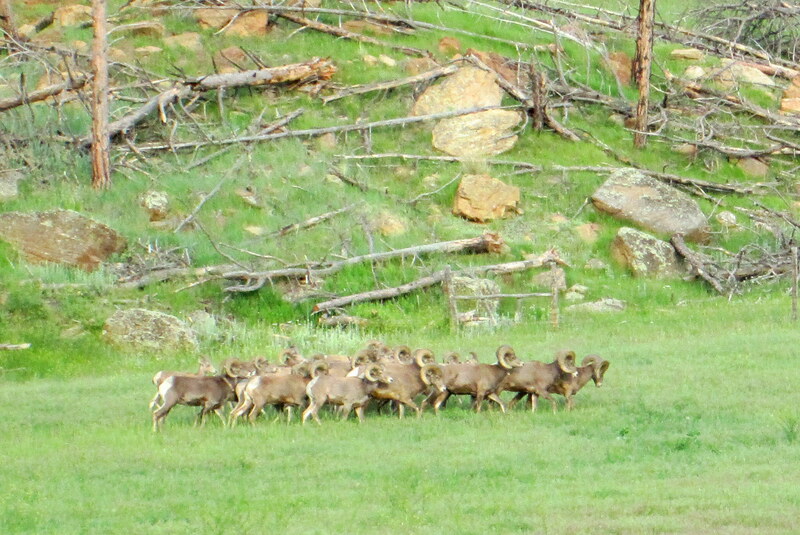 I counted 23 Bighorn Sheep – all rams. We could see them from the house as I was getting ready for work. Hubby and I grabbed the camera, jumped into the pickup and ‘went on safari’. There were all sizes of rams several old ones with full curls and even a couple of yearlings. 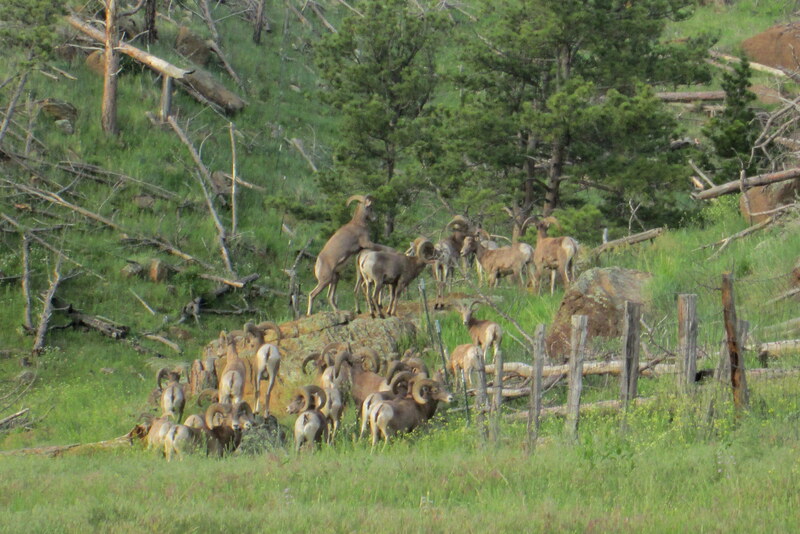 We have been seeing Bighorn sheep around here lately but never a group this large. It was fun to watch how they moved – traveling in a tight pack with an occasional yearling tagging along behind – jumping and kicking up his heels like he was just happy to be out with the big boys. Hubby thought perhaps they stuck so close together because the flies were bothering them. They weren’t bothered by the pickup as they slowly worked their way along the fence till they got to the spot where they crossed the fence. With a quick jump they bounced up to the top of the rock and easily stepped over the fence. It appears the fence is a little low there but then our cows normally don’t climb on rocks! It’s official. These bees are going to drive me to drink. Don’t get me wrong – I LOVE MY BEES!!! But I have always been a worrier and it appears I have adopted something new to worry about. It’s not because they’re aggressive – far from it. In fact, I’ve been working with the hives lately without my crazy ranch wife bee suit and we’ve been getting along just fine. I know one of these days I will probably end up with a nice big swollen bee sting right on the end of my nose but for now they are tolerating me pretty well. One week after installing the girls into their new homes it was time to open the hives and make sure the queens (Beatrix and Matilda – of course I’ve named them) had made it out of their cages. I suited up and headed out with my shiny new smoker and an assortment of tools any seasoned beekeeper would be proud of. Hubby was all set to take pictures but the camera battery was dead so instead he drove the pickup as close to the hive as possible and watched from the safety of the front seat. Yes – he had all the windows rolled up tight. 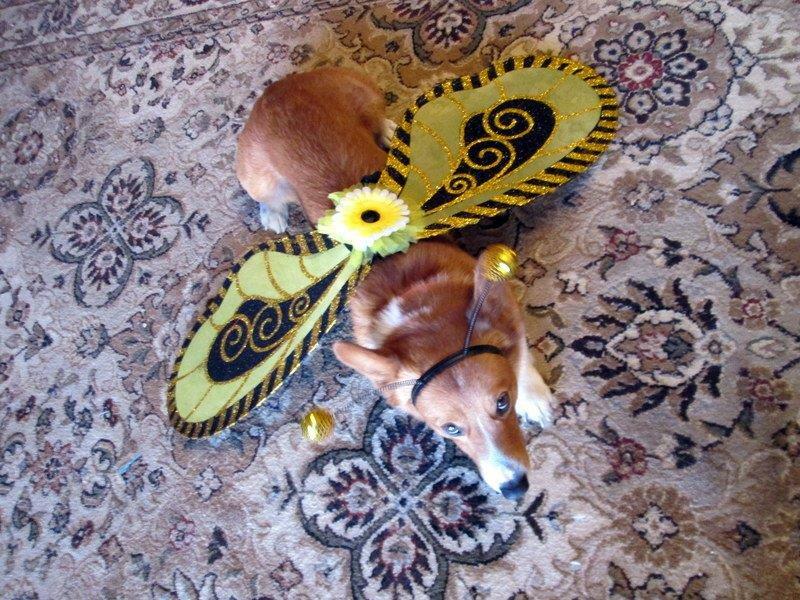 Something tells me he’s still not sure about this whole ‘bee thing’. It was a beautiful day. The bees were happy, the smoker worked like a charm and best of all the queens were out of the cages. I was super surprised to see that each of the hives already held nearly half a box of wonderful honeycomb. It was impressive – after only one week the bees were doing great. Carefully, I lifted one bar of comb out of the box for Hubby to see. It was beautiful, light yellow and covered with bees. I looked at Hubby with a huge grin on my face when the whole comb fell off the bar and crashed onto the ground! Nooooooooo!!!! I felt horrible. What was I supposed to do now? I knelt there for a while and watched the churning pile of bees but couldn’t see the queen. What a mess! I didn’t know what to do so I closed the hive and walked away, hoping the bees could sort it out. And in about 5 minutes the whole cluster of bees was back inside where they belonged. I’m sure my little bee girlfriends were cussing under their bee breath about the inept beekeeper they got stuck with but at least all seemed well in the hive world once again. At least until the next evening. After work I went out to do some gardening and check on the bees when I noticed lots (and I do mean LOTS) of activity at the front of Beatrix’s hive. I watched for a while thinking they must have really started gathering goodies when I realized there wasn’t hardly any flowers blooming yet. I took a closer look. Bees were coming and going in a frenzy. It looked like an international airport with the departing bees climbing up the front of the boxes to take off as the incoming bees flew straight to the entrance and ran inside. There were also clusters of bees struggling on the landing pad and dead bees had started to litter the ground. I checked the second hive and found lots of bees coming and going but nobody wrestling on the landing pad. I remember something about this in my favorite book Beekeeping for Dummies. I looked up ‘Robbing in Hives’ and from the book’s description it was pretty obvious that’s what was going on. Matilda’s hive was attacking Beatrix’s hive and they were stealing whatever they could. The book stated that this behavior occasionally happens after a hive has been opened and the scent of honey has been released into the air. I’m sure that when I dropped the piece of comb on the ground I had made matters even worse. And to top it off, the book also stated that the type of feeder I am using is bad for causing this behavior as it places a food source (sugar-water) right at the entrance of the hive. How did I miss that when I read the book? OK, I had made lots of mistakes and I guess its time to build some new feeders. But that would have to wait till I could get the robbing stopped. I checked several websites and tried to figure out what to do. It was getting dark so I blocked off part of the entrance with some wood chips to narrow down the opening – hopefully to make the hive easier to defend. One of the websites I found had also shown a simple wooden frame covered with window screen to seal off the entrance so I ran to the shed and found the materials I needed and quickly whipped up one. With staple gun in hand I waited till the temperature dropped and the robbing stopped for the night. It was nearly 10:00pm when the bees settled down for the night and I stapled the screened frame into place. The next morning, with the regular hive entrance completely sealed off and only a very small opening (just big enough for one bee at a time) at the very top of the frame I waited to see what would happen. It worked like a dream. The attacking bees remained focused at the entrance while the bees who lived in Beatrix’s hive were able to exit the hive and move around under the screened area untill they found the opening at the top. They were soon coming and going without any problems. After 4 or 5 days of this it appeared the attacking hive had given up and were soon side-tracked by the opening blossoms of the gooseberry bushes in our tree strip. I ran back to my copy of Beekeeping for Dummies. Thankfully, it appears they were simply ‘bearding’ – kind of like a beehives’ version of everybody going out to sit on the porch and enjoy the cool evening air. That’s a relief. According to the book this is sometimes caused by not enough ventilation. OK girls – I get the hint – it’s time to remove the screen (you can see the side of it on the left side of the photo). Once again life is good in the beehive world…. At least I think it is. I agree – we need a drink! Spring is in the air – finally – and I am ready. You might remember last winter I took a few community ed classes – scuba diving, handguns and beekeeping. While it may seem like an odd combination these are all things that interest me. That explains a lot – don’t you think? Anyway, it is spring so therefore it is time for me to try out one of the interests for real. As of a week ago I am a beekeeper! Anyone who knows me may have already guessed it didn’t happen without mishap – this is me we’re talking about after all. I have always loved bees – they are fascinating creatures and even though I have been stung several times that did nothing to dim my fascination for the little darlings. Last summer when I noticed a lack of bees at the ranch I knew it was time to get serious. The very first thing you learn when you decide to keep bees is that it actually takes some time and a lot of planning before the bees even show up. Since the internet is a wealth of information I started there and that is where I first came across information on the Warre hive (Pronounced War-ray). These hives, also known as the People’s Hive were created by a French Abbot – Emile Warre (1867-1951) who had studied bees and hive designs for many years. In fact he had spent most of his life building different types of hives and testing them, usually a dozen of each model. Instead of creating a hive that was built to be the best for the beekeeper and to get the most honey production he designed a hive that is the healthiest for the bees themselves. 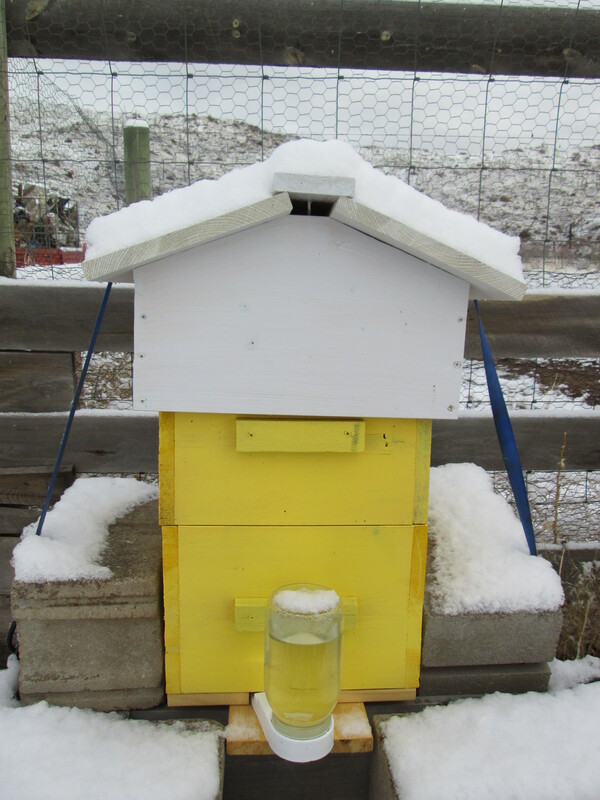 Here’s one of the hives (full of bees) on May Day – we woke up to 2″ of snow. The jar of sugar water is their feeder. Top Bar hives are built to let bees do what they naturally do. Imagine a wild honey bees’ home – a hollow tree. Warre hives aren’t round but they are smaller than the hives you see all over the countryside – the better to keep warm in the winter. When bees move into a new tree they start at the top and build their comb downward, starting with brood comb that soon hatches out and is then filled with honey as new comb is built below for new brood. Since the brood is always growing in new comb supposedly there is less disease. Summer passes, and the tree fills with honey from the top down. In hives with frames (the most common hives you see) extra boxes, or supers, are added to the top of the hive forcing the bees to build up. Warre Hives are the opposite – the whole hive is lifted and the new boxes are added to the bottom allowing them to continue building downward. In the fall you harvest the boxes of honey off the top without really opening the hive and disturbing the bees. Makes sense to me. So I built two of them last fall. 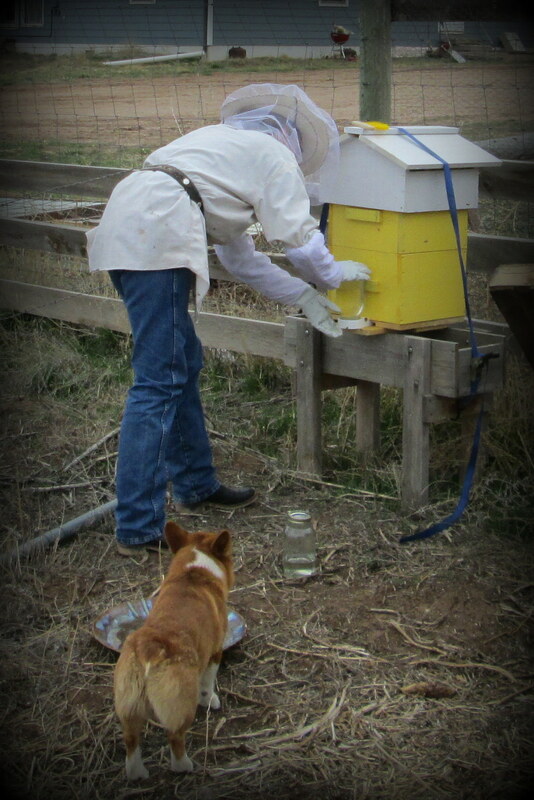 My education continued last winter when I attended a beekeeping class in Rapid City. I was hooked and couldn’t wait for spring. I ordered 2 packages of bees on January 2nd and then patiently (hey – I tried) waited for the bees to arrive – sometime in April or May. The guy who taught the class also was the one who would be coordinating the bee shipment so I checked with him several times and again on Friday and was told the packages of bees would be leaving Nebraska Friday night and would be ready to pick up Saturday morning in Rapid. I quickly set up my hives and told everyone who would listen that “THE BEES ARE COMING, THE BEES ARE COMING!!! Since I was making a trip to Rapid and since I am an obsessive multi-tasker, I had several errands lined up as well. I mean – why waste a trip? We have been cleaning out the garage which was full of stuff from Dan’s folks’ house so I filled my pickup with boxes of items to donate to the local Goodwill. It looked like a mobile rummage sale with every available nook and cranny packed to capacity with everything from old wool suits to ceramic ducks. I had my list made out – all numbered and listed in order so I would not waste a moment because I had to get back to the ranch ASAP! Both our boys would be here for the weekend and since we had extra help, Hubby decided we should brand the calves. I was feeling rather proud of myself Friday night for being soooo well organized – right up to the time the phone rang at 9:00 pm. It was the bee guy who informed me that he had messed up and hadn’t ordered my bees. He apologized and told me for sure they would be in the next shipment 2 weeks later. I sat up late, drinking beer and tatting into the wee hours of the night and mostly feeling sorry for myself. But Hubby was thrilled that there would be one more set of hands to order around Saturday morning. We got up early, saddled horses and gathered cattle. We got them in with few mishaps and spent a good amount of the morning sorting cattle into one corral, calves into another and bulls into the last one. The bulls were first through the chute. We doctored the sick one, treated them all for parasites, checked them over and turned them back into the ‘horse pasture’. Next came a few yearlings – the ones that didn’t go to the sale last fall because they were too small. They got the same checkup plus they got branded too. It was nearly 11:00 so I ran up to the house to check on dinner and before I could open the door I heard the beeps of the answering machine. You guessed it – 5 calls. I stood in the middle of the kitchen, covered in a thick layer of dust and manure, reeking of poop & branding smoke and basically looking like something the cat hawked-up. The guys down at the corrals were getting the cows into the alley at that very moment so there was no way I could just jump in my pickup and head to Rapid. By this point I was pissed and wanted to sit down and cry but thankfully the last message was from one of our neighbors. I tripped over the chair and sprawled on the floor as I scrambled for the phone, dialing the number as fast as I could with crap encrusted fingers. By the time our neighbor answered the phone his son-in-law (whom I had never met but already loved like a member of the family) was headed for home – with my bees and the tools I had ordered!!! I raced back to the corrals to share the news. Hubby wasn’t exactly thrilled but what do you do? I helped push cows through the chute for an hour than sped out to the end of the road and waited for half an hour before this wonderful young man showed up with a SUV buzzing with bees. We sorted out my stuff and quickly made plans to get together soon to compare bee notes before I headed back to the ranch with roughly 20,000 bees and one nervous little dog in the pickup. Of course when I heard the bees weren’t coming I had put away all the stuff I had gathered up. So I ran through the house like a crazy woman. I had planned on buying a bee suit when I picked up the bees but since that didn’t happen I grabbed one of Hubby’s large white work shirts, tightened my belt around it, crammed on my hat and the veil I had made to fit over it, pulled on my new bee gloves that reach up to my armpits, and even stopped long enough to tie ribbons around my legs to keep the bees from flying up my pant legs. Talk about your cheap thrills! I ran out the door armed with a spray bottle and 2 quart jars of sugar-water and absolutely no idea what I was doing. For months I had pictured this moment in my mind. I had read every book I could get my hands on. I had watched videos on You Tube of calm, cool and collected people dressed in spotless white suits gently introducing their bees to their new homes. None of that was me. I was stressed, smelly, dirty and looked like I had been living in a barn. Besides that, I was in a hurry and for the life of me I couldn’t remember a damn thing I had learned. There wasn’t time for me to figure out how to run my shiny new smoker so I didn’t even try. Instead I sprayed the bees with a fine mist of sugar-water through the screened sides of the box. Then I lifted off the cover of the first hive and opened up the bars across the top. Turning to the box of humming bees I lifted out the tin can of sugar-water and hanging there beneath it was a cluster of the most beautiful bees you ever saw! They hung there like a bunch of grapes, happily humming as they waited their turn at the sticky juice. It took me a few moments to figure out where the queen was but finally realized her cage was hanging just inside the box attached to a metal strap the stuck out through a slit in the top of the box. I lifted her out but couldn’t even see her through the mass of bees that surrounded her. I brushed some of them aside and the air filled with bees. It was great!!! Then I turned the box upside down and dumped a great mass of bees into their new home. I pulled the cork from the bottom of the queen cage and stuck in the chunk of candy that she and the workers would have to eat through to release her then hung the cage inside the hive from one of the top bars. 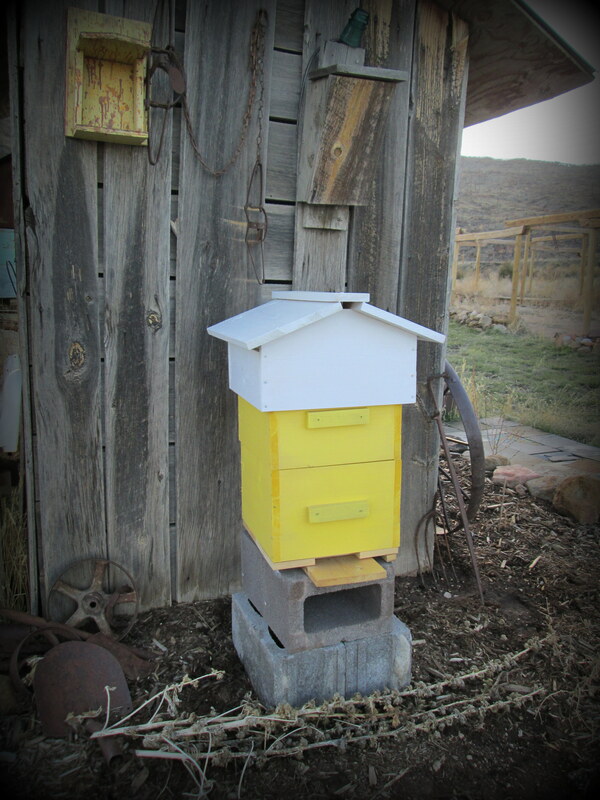 I couldn’t get all the bees out of the package so I sat it near the entrance and quickly put the top back on the hive. I ran to the second hive and did the same steps. I didn’t know if I had done it right or messed up badly but when I ran back to the first hive I was thrilled to see guard bees at the entrance with their tails in the air and their wings fanning the scent of the hive out for the other bees to home in on. And most of them had – only a couple remained in the box. These truly are amazing creatures. I wanted to stay and watch but knew I had to get back to the corrals. I stripped off the gloves, white shirt and veiled hat while running to the pickup. Jumped in and gunned it down the driveway to the corrals, hyped up on bee thrills and adrenaline only to get chewed out for taking so long! Apparently, things had gone bad as soon as I left. The cows didn’t want to go through the chute and a couple of them had even thrown hissy-fits once they got in the chute and pretty much busted it up. Any ranch wife will tell you that when things go good it’s because her husband has planned it so well but when things go bad it is her fault – even if she is miles away at the time. 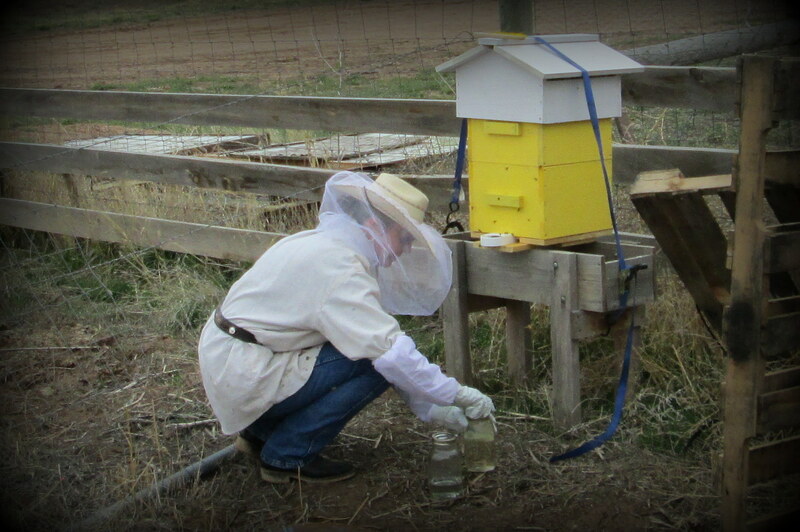 Here’s a couple of photos of me in my crazy ranch wife bee suit. I have been feeding them sugar-water until the flowers and trees start blooming and they are hungry little ones as they can polish off a quart in about 2 1/2 days. Interesting fact: The US Department of Agriculture lists honey bees as livestock so I guess you could say we have increased our herd by over 20,000 head! 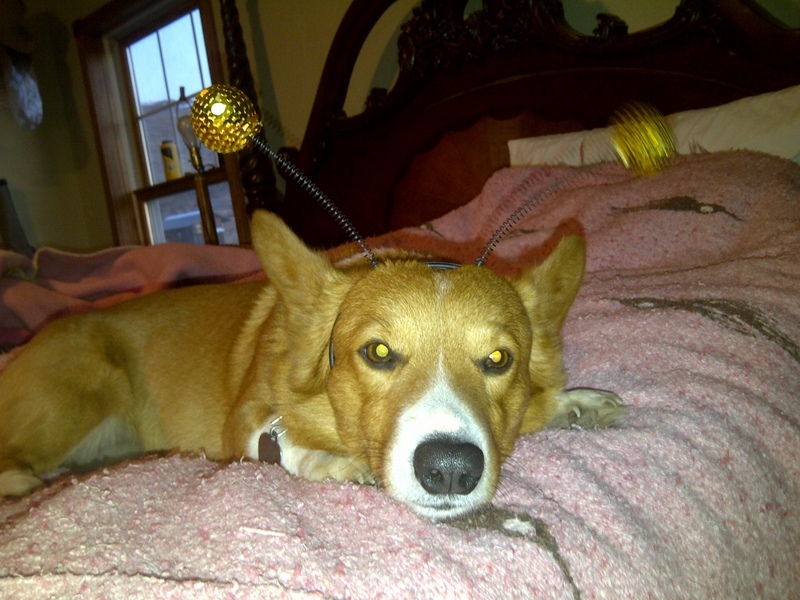 Steve isn’t sure what to think of this whole ‘bee’ thing but he is fearless when it comes to livestock.